The Secretary of the Interior's Standards and Guidelines for Archeology and Historic Preservation, issued in 1983, provide technical advice on key aspects of archeological and historic preservation activities and methods. 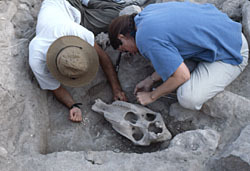 The activities include preservation planning, identification, evaluation, registration, documentation, and treatment. They were prepared under the authority of the National Historic Preservation Act of 1966, as amended, specifically section 101(f), (g), and (h), and section 110. The long-term care and management of material remains and associated records is an important aspect of the preservation and investigative activities of archeological sites, yet there is relatively little discussion of it in these standards and guidelines. For example, the overall standards for preservation planning, the process that organizes and relates all of a project's subsequent preservation activities (identification, evaluation, registration, documentation, and treatment), does not mention the curation of the resulting collections. In many cases, only associated records, including digital data, may result from the planned activities, but there is no consideration of how these records are to be preserved. The standards for identification concern gathering information about historic properties in an area, including archeological sites, depending on the planning and management goals of the project. Several aspects of identification focus on records. One is the use of archival records, but there is no acknowledgement of the importance of the proper management of archival documents for the identification process. Also, there is emphasis on the need to systematically gather and record identification information, but no discussion on how these important data are to be managed for future access and use. Another focus of the identification standards is on field survey and analysis. Unfortunately, there is no discussion of the potential information that might be gleaned from existing archeological collections prior to survey, or of the proper long-term care of a collection that might result from survey activity. The standards for evaluation consider how to determine if identified properties are significant and the process of inventorying significant properties. Evaluation can involve the accumulation of both data and material remains in order to determine significance, while inventory is the accumulation of data. Although retention, access, and use of the records regarding both significant and insignificant properties are advocated in these standards and guidelines, no guidance is provided on how or where these record collections should be managed. The long-term care and management of any material remains collected and analyzed is not addressed at all. Fortunately, the specific standards for archeological documentation, the process of gathering information on archeological properties at various stages of planning, identification, evaluation, and/or treatment, consider both the collection of appropriate materials and their subsequent curation. The primary goal of curation in these standards is to preserve the resulting artifacts, specimens, and records to ensure their future access and use. This goal was and still is right on the mark. the need for adequate space, facilities, and professional staff by the repository that curates the resulting collection.